Due to a busy summer schedule at La Foret, the social dance will be on hiatus until further notice. Next dance to be announced. We are so happy that La Foret's monthly community dance parties have had such a great turn out; many dancers have inquiries for more opportunities to dance and learn more! So we now also offer private and semi-private dance lessons! Lessons are customizable: whether you're looking to learn how to social dance, create a couple's wedding dance, challenge yourself to compete like "Dancing with the Stars," dance as a means of fitness and muscle toning, self-improvement and confidence building, or any other reason to dance! This is a very unique setting to learn, at a 'family-friendly' price you'll have fun training with an accredited dance professional, Tasha. Come out to the woods, it feels like a far get-away, and its only about 15 minutes from Colorado Springs. La Foret provides a stunning setting to have dance lessons. Dancers comment that as they head home, "feel so refreshed after dancing and enjoying the outdoors, I head home feeling wonderful!" Sign up as an individual or as a couple, in hour or half-hour private lesson sessions. 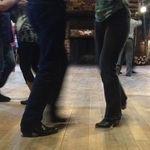 A private dance lesson will move at your pace, and focus on exactly what you want to learn. Lessons take place in available building space at La Foret. Semi-privates are created specifically for you, by you. Assemble your own group-- whether a full wedding party, family members, co-workers, friends, a church group, youth or adults, etc.-- if you have at least four people, we can make a semi-private tailored to your needs. One-hour Semi Private Lesson must have minimum of four dancers. Email tasha@laforet.org to ask more questions and book a lesson, or visit Happy To Dance to learn more about dancin' opportunities!